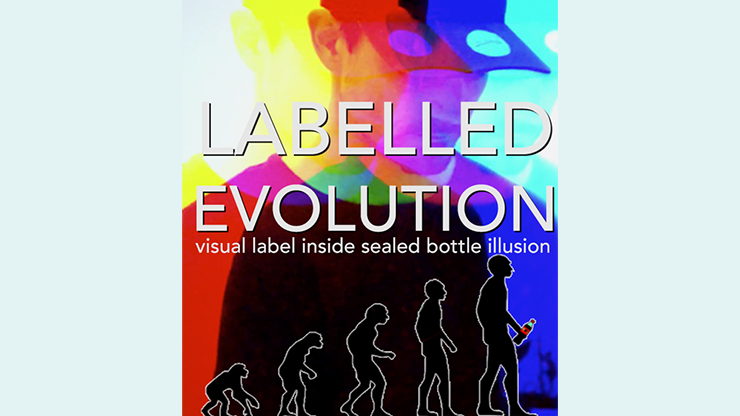 Labelled Evolution is all of Ben Williams's best work to date on the Label Inside Bottle illusion. Within this 3 hour download video, you will learn many different versions of his effect, Labelled. This really is a huge compilation of ideas and methods guaranteed to have something for everyone. "Labelled Evolution is a guaranteed reputation maker that every magician should own!" You fairly show the spectator a cola bottle and write something on the label, even peeling it back to show that the contents of the bottle are perfectly ordinary underneath. With a casual shake, the spectator will see the marked label VISUALLY MELT inside the bottle, before their eyes. You can instantly hand it out for examination and leave it as a memorable souvenir with your spectator FOREVER! Everything is fully inspectable, even if they if open up the bottle to take the label out. "Labelled evolution is next-level visual magic that you can not only perform, but you can give it away. Outstanding!" Labelled was originally created back in 2004 and was well received throughout the magic community. However, despite its success, there were some drawbacks to the effect; you weren't free to place the bottle down; you could not show the spectator that there was no label inside; and there was no way to begin the routine with any sort of inspection. Ben has spent the past ten years developing and refining his effect, eradicating these restrictions and leaving you with one of the most detailed and visual illusions he has ever created. "Labelled has been in my close-up set for around 10 years. Labelled Evolution will ensure it will remain in my act for at least 10 more." - A variety of methods for performing Labelled with different set ups, so you can choose your favorite method. From fast performances to full routines, Ben shares all of his best work on the plot, including his theory and ideas on how best to introduce the effect. - An almost impromptu version of Label Through Bottle that can be done with a borrowed bottle and has the SPECTATOR'S SIGNATURE on the label. - His method for removing a cap from a drink bottle without breaking the seal; this method is now streamlined to be fast and effective. You can easily remove 4 or 5 bottle caps in the time it takes to make a cup of coffee. You will literally see him do this on the download (Ben likes his coffee!). This method alone is invaluable if you perform ANY routine with a drink bottle. - His personal parlor performance of Labelled, perfect for special occasions, top tables and important clients; guaranteed to make an impact. - A bonus effect, his souvenir coin in bottle routine. After a coin is melted through the side of the bottle held by the spectator, you reseal the cap onto the bottle, permanently trapping the coin inside. This is the perfect coin in bottle for a seemingly impromptu street magic trick. "Labelled has been one of my favorite tricks to perform for years and I didn't think it could get any better. I was wrong! Ben has taken it to a whole new level!" Yes, it is not an illusion or simply glued back together -- the factory seal on the official cap is genuinely unbroken. Yes! In fact, it is important to have it closely examined! This is part of the beauty of the effect. Yes, Ben rarely ever keeps a Labelled bottle after performing it. He has had many people over the years message him to say they treasure the bottle and have not and will not ever get rid of it! Ben teaches you his most streamlined way to prepare the effect. It will take a little bit of practice but it is not too hard to do at all. If you keep the bottle after performing the effect, you can reset in seconds. As half of the prep is reusable, you will rarely ever have to remake those parts to the effect. If you give the bottle out, you will of course need to prepare that part of the effect again. No, in fact the effect is so easy to perform it is ridiculous! Once set up, you will find yourself fooling yourself in the mirror within no time! Yes, if you so desire! One great development is that Ben has worked on the routining so you can start the effect with a bottle that is bought from a shop so it is of course 100% examinable. Imagine this for a social media video! With this subtlety and the other convincers like peeling back and writing on the label, you have the ultimate illusion. Download this video and learn Labelled Evolution!